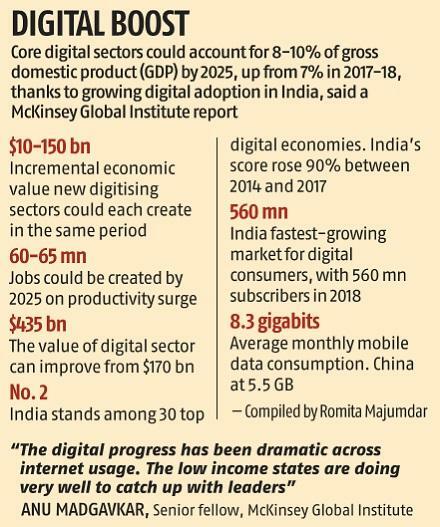 Thanks to growing digital adoption in India, core digital sectors such as IT and business process management (IT-BPM), digital communication services, and electronics manufacturing could account for 8-10 per cent of GDP by 2025, up from 7 per cent in 2017-18, noted a new report by McKinsey Global Institute. Newly digitizing sectors (including agriculture, education, energy, financial services, healthcare, logistics, and retail) as well as digital applications in government services and labour markets could each create $10 billion to $150 billion of incremental economic value in the same period. Some 60 million to 65 million jobs could be created by the productivity surge by 2025, although redeployment will be essential to help the 40 million to 45 million workers whose jobs will likely be displaced or transformed by digital technologies, based on McKinsey estimates, said Anu Madgavkar, senior fellow of the McKinsey Global Institute, co-author of the report. The value of the digital sector can improve from $170 billion at present to almost $435 billion during the same period. ”On the consumer side the digital progress has been dramatic across internet usage. Interestingly, the low income states are doing very well to catch up with the states leading this growth. Seven out of top ten fastest growing states are those with lower average per capita income.,"Madgavkar told Business Standard. She noted that these states are accounting for almost 130 million new internet subscription in the country, due to lower cost and better internet infrastructure. The report found that among the 30 top and fastest growing digital economies in the world, India is second only to Indonesia. India’s score rose by 90 per cent between 2014 and 2017 while Indonesia grew 99 per cent. India is one of the largest and fastest-growing markets for digital consumers, with 560 million internet subscribers in 2018, second only to China. Indian mobile data users consume 8.3 gigabits (GB) of data each month on average, compared with 5.5 GB for mobile users in China and somewhere in the range of 8.0 to 8.5 GB in South Korea, an advanced digital economy. 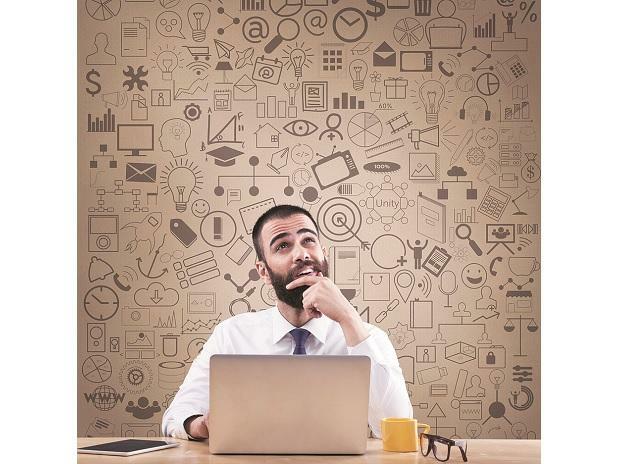 “India needs to address the uneven digital growth across businesses to ensure that this growth continues at scale and firm size is not always a differentiator., “ she added. While large firms are far ahead in digital areas requiring large investments like making sales through their own website, small businesses are leapfrogging ahead of large ones in other areas, including acceptance of digital payments and the use of social media and video conferencing to reach and support customers.